The Keswick Country House Hotel sometimes limits bookings to 2 or more days. Deluxe Double room with en suite bath & shower, hairdryer, direct dial telephone, flat screen television with freeview, tea & coffee making facilities plus a welcome tray with complimentary mineral water and a box of Keswick Chocolates . Most rooms have views of the gardens and surrounding countryside. Junior Suite room with separate lounge area with 32" plasma television with freeview, complimentary towelling robes and newspaper, hairdryer, direct dial telephone, tea & coffee making facilities plus a welcome tray with mineral water and a box of Keswick Chocolates . Most rooms have views of the gardens and surrounding countryside. Junior Suite sometimes limits bookings to 2 or more days. Standard double sometimes limits bookings to 2 or more days. Twin-bedded room with en suite bath & shower, hairdryer, direct dial telephone, flat screen television with freeview and tea & coffee making facilities. Most rooms have views of the surrounding fells and countryside. A short walk away from the market town of Keswick and Derwentwater Lake, the Keswick Country House Hotel is set in 4 acres of landscaped gardens. 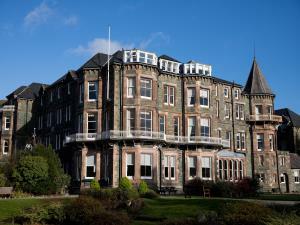 The hotel has a Victorian conservatory and cocktail bar, as well as the beautiful Lonsdale Restaurant overlooking the gardens and showcasing a British menu in the most humble way. The fresh and artisanal produce allow the experience to speak for itself. Children reductions available when sharing with 2 adults. Situated next to a public park with tennis courts and public splash fun pool. Free WiFi available throughout the Hotel. Children welcome from any age. Leave M6 jct 40, following signs for A66 for Keswick. Once in Keswick, follow signs for the town centre. Turn right by the traffic lights and into Station Road. Follow the signs for the Leisure Pool.